The garden is bursting with bird life. Every day more baby birds appear, freshly fledged. 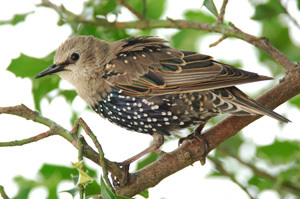 Today it was a starling and, judging by the noise coming from our hedges every time an adult starling flies past, there are plenty more to come. In the past few days, I’ve seen baby siskins, sparrows, dunnocks and blackbirds. It’s an absolute joy. In the midst of all this planetary devastation, it consoles me a little to know that some additional birds enjoyed life in our garden for a short time. It’s funny to watch the new birds figuring out what they should be doing. I’ve been observing the dunnocks and, whenever they see their parents shuffle by, they do exactly as they did when they were still in the nest – frantically flap their wings and squawk until they are fed. At some point, mum or dad will teach them to shuffle about the ground and pick up their own seeds. And that’s pretty much it for the life of a dunnock, apart from a bit of occasional breeding and flying. I hope they’re not disappointed when they find out what the “meaning of life” is for them.